Fine examples of leading 4-post vehicle lift technology. Robust and attractive with platform recesses for hydraulic or pneumatic play detectors which can be installed or retrofitted anytime. Platform lengths from 4.65M to 6.10M, all with broad user friendly 630mm width, and reinforced substructure. A popular choice for vehicle testing, ATL bays, commercial workshops and new LWB work. 24V outlet sockets at each corner for inspection lamps, crossbeam airline socket and optional APC (any post control) for ease of use and time saving. Built in Europe exclusively for Boston, with UK software and controls. Membrane keypads with LED indication and PLC control. Reprogrammable for software upgrades. Stainless steel turning plates on nylon glides and a rubberised hand control/torch unit are further features. Boston’s 2 Post car lifts are a popular choice for progressive workshops everywhere – a favourite workhorse, well established throughout the garage equipment industry. All our lifts have a high quality paint finish and carry a two year warranty. 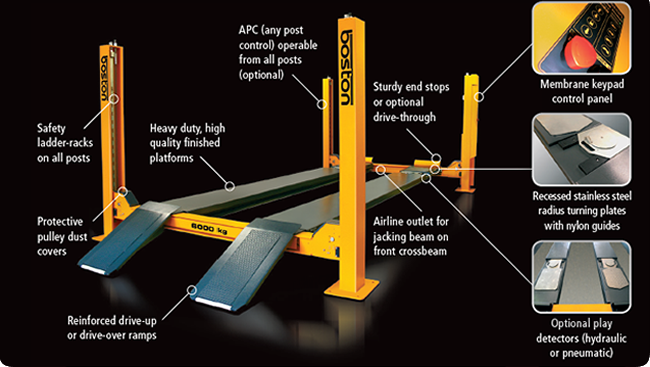 Our popular B503, 2 post, 3 tonne mechanical screw vehicle lift has extra low lifting pads adjustable from just 90mm up to 190mm – ideal for working on sports cars and light commercials. 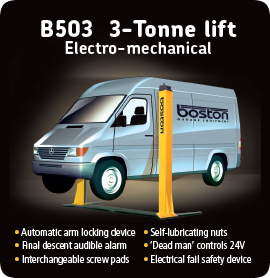 The Boston B503 is a high quality, European manufactured, two post electro mechanical screw lift with base frame. As you would expect from Boston, it is built to the highest standards and designed to exceed your expectations in every aspect. Boasting a 3 tonne load capacity, formidable safety features and adjustable screw pads to accommodate a wide range of vehicles, the B503 is a solid investment for the safety conscious workshop not willing to compromise on quality.